Mad Hatter Auto Service in Cedar Falls, IA was first known for our quality muffler and exhaust work. Since then we’ve grown into this area’s best repair facility. Our team meets any and every service need that you have, which still includes our top-notch exhaust system service. Keep your vehicle’s cabin free of harmful toxins with an excellent exhaust system repair or maintenance. The engine’s under the hood and it’s giving off toxic fumes, so our exhaust service will redirect these fumes away from your vehicle’s interior. From simple muffler replacements to polished stainless steel systems and everything in between, we do it all! We are proud to sell and install more truck dual exhaust systems than anyone else in the Cedar Falls, IA area! Come check out the largest inventory in the area! 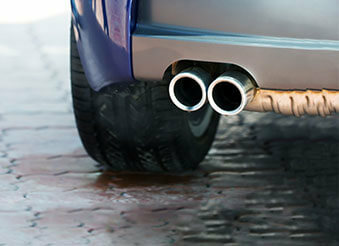 The first person to be affected by a faulty exhaust system is the driver. Make sure you and your fellow passengers are safe on the road by keeping out all harmful emissions. It’s our responsibility to protect the planet as well. We help drivers meet the acceptable standards for vehicle emissions. While Iowa does not have the population to worry about smog pollution, it doesn’t hurt any of us to properly maintain our vehicles’ exhaust. According to the Iowa DMV, one poorly maintained vehicle creates more pollution than 30 properly maintained vehicles. Mad Hatter Auto Service helps you maintain excellent visibility and breathing conditions throughout your neighborhood. We keep your vehicle well-tuned. By checking your vehicle’s emission control systems, we help protect children, the elderly, and individuals with respiratory issues from difficulty breathing. Your vehicle’s quality exhaust service will also improve its fuel efficiency. The sound of your vehicle’s engine is controlled by the muffler, and we can provide any muffler repairs, replacements, or customization services. We have decades of top quality exhaust system service. Make sure the service experts at Mad Hatter get a look under the hood first. We help you avoid misdiagnoses and receiving unnecessary repairs by using our state-of-the-art engine diagnostic equipment. Let’s improve your vehicle’s gas mileage. We put money back in your wallet by saving you money on our quality exhaust services, as well as at the gas pump. Give us a call today at 319-277-4323 to schedule your next exhaust system service. You can save time by using our convenient online scheduling system right now. Next time you’re in the area, feel free to stop on by. We gladly accept all of our walk-ins!